More and more clients are filing chapter 13 bankruptcy to recover their vehicle which was impounded by the city of Chicago. This is the very common case where someone with Chicago parking tickets winds up on the boot list and eventually their vehicle gets impounded. They also receive a notice from the Secretary of State in Springfield that their drivers’ licenses are suspended due to those very same parking tickets. For individuals who find themselves in this predicament, there are very few solutions. The first solution is pretty untenable. That would be paying off the debt or working out a very high installment payment plan with the city of Chicago in order to recover the vehicle. The second solution is the best solution. This would be filing a chapter 13 bankruptcy and reorganizing the debt owed to the city of Chicago. The advantages of filing a chapter 13 are tremendous. After filing a chapter 13 bankruptcy, you can likely recover your auto within 2 to 4 days. Proof of your bankruptcy filing is submitted to the city of Chicago as well as to their current collection law firm immediately upon filing. Notice is simultaneously faxed to the Illinois Secretary of State in Springfield. So the bankruptcy lawyer is going to be handling two aspects of your situation simultaneously. There will be notice to the city of Chicago and its legal department as well as to the Secretary of State in Springfield. Once this is done, the debtor can typically go to the city of Chicago and arrange for the release of the vehicle. The client must realize that filing a chapter 13 can take a little bit of time. The chapter 13 bankruptcy attorney must meet with the client, prepare the documents, have them signed, reviewed again and then filed electronically with the Clerk of the United States Bankruptcy Court. To assist your attorney, you should have the most recent two months’ worth of paycheck stubs as well as the most recent four years of federal tax return filings. Many attorneys will file without these documents, however, they must be provided shortly after filing otherwise the case will be automatically dismissed on the 46th day after filing if those items are not submitted to the trustee. The other major item that the debtor must do before a case can be officially filed is to take a credit counseling session. This credit counseling session can last anywhere from 1 to 2 hours and it could be accomplished online or over the telephone. Although it is pretty much common knowledge at this point that a credit counseling session must be completed prior to filing, I do often hear from clients that they were not aware of the fact that they had to submit to this course. For this reason, we provide the credit counseling information at the initial consultation. This way the debtor can get it out of the way immediately and also prevents the debtor from saying they were unaware of the requirement. After all, filing bankruptcy can be stressful. Being without your vehicle and having your driver’s license suspended can be frightening. You need all the help and reassurance and guidance that you can get from your chapter 13 bankruptcy attorney as you’re going through this difficult time. This is why I advised my clients to please be patient. It takes a little time to prepare the documents, review them and have them signed. It then takes a little time to get the case filed and prepare the automatic stay. It then takes additional time to fax the information to the city Chicago, its attorneys and the Secretary of State in Springfield. Then you have to allow those organizations time to process the information that they have just received. This can all be done in a matter of one or two days if everybody moves quickly and efficiently. However, when you’re dealing with the city of the Secretary of State there are some time snags. When this occurs, we simply refax the filing information, call the specific parties and push for the return or release of the vehicle in question. 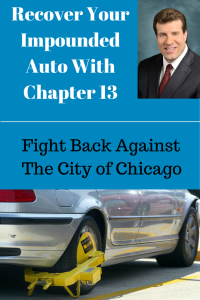 If your car is impounded and your driver’s license is suspended and you don’t know where to turn, then chapter 13 can be your best option. The results are usually fantastic. Just be sure to be a little patient and give your attorney all the information he or she needs as well as the time to recover or release your auto. For more information on chapter 13 and your particular situation, you can contact me for a no cost, no obligation consultation at 847-520-8100.